Donna Terry to design Historic Glen Magna Estate's Drawing Room - Boston Design and Interiors, Inc.
Boston Design and Interiors, Inc. is pleased to announce that their CEO and lead designer, Donna Terry, will transform the drawing room of the famous Glen Magna Estate located north of Boston for the Danvers Historical Society as part of a fundraiser to help preserve this mansion, the Derby Summer House and other properties of historical importance in the area. 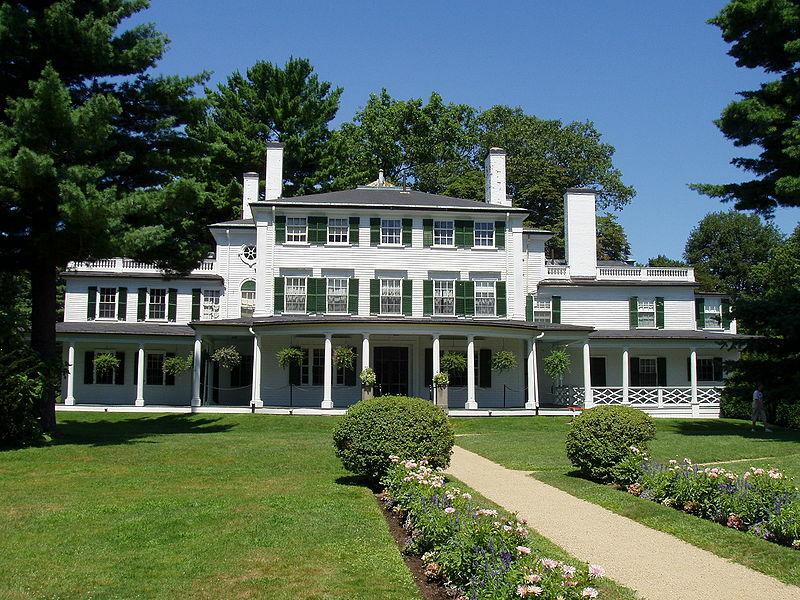 The Glen Magna Mansion was once the summer retreat for generations of the Peabody-Endicott family. At almost 20 feet by 40 feet, the drawing room is the mansions largest space. Inspired by the beautiful carved fireplace that the Endicotts brought back with them from Egypt in 1932, Donna Terry has created an Art Deco design scheme with Neoclassical/Egyptian revival roots. Our firm has designed custom draperies and furniture, commissioned large scale custom art work, and even created some custom lighting for the room. Since the mansion was built at the end of the nineteenth century, Donna Terry approached the design from the standpoint of what was making an impact stylistically on the decorative arts and interiors in the first part of the new twentieth century. Two events had a major influence on the times. One was the arrival of the Ballet Russes on European stages around 1912- with its sensuous fabrics, pattern and color adorning characters depicted from the Orient, Egypt, and Africa. The other was Howard Carter’s discovery of King Tutankhamen’s tomb in 1922 which renewed the public’s interest in Egypt and the exotic. By the 1930’s consumer passion for orientalism and the exotic would have culminated with travel to these faraway lands being advertised on the pages of Home and Garden magazines. 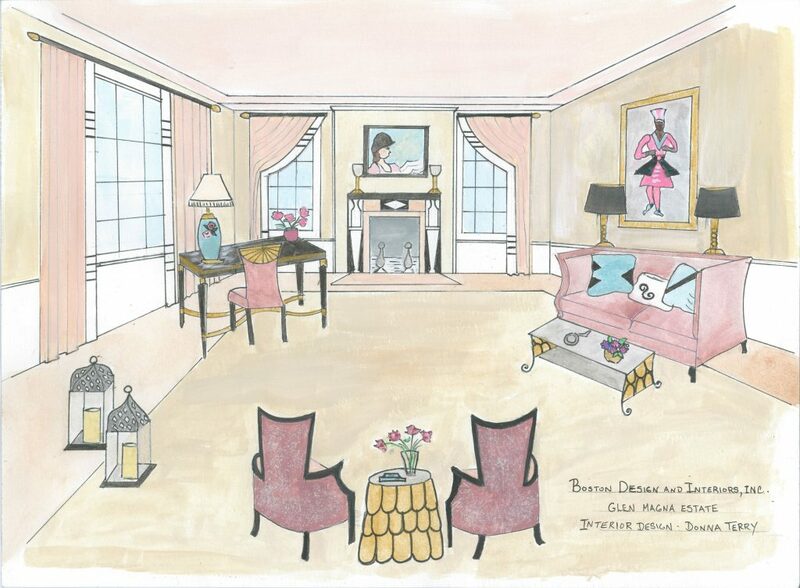 Here is a sneak peak of one section of the drawing room as rendered by Donna Terry. The Danvers Historical Society will open its doors for its Holiday Showhouse in December. 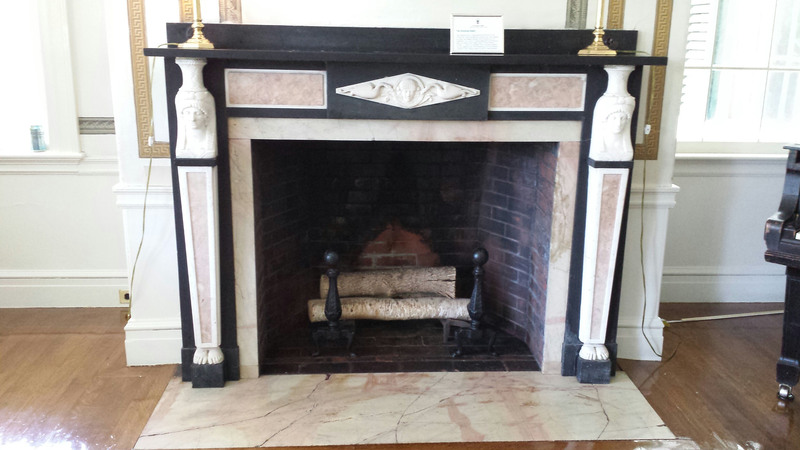 For more information on the Showhouse visit the Danvers Historical Society’s website.